The Hendy family and the design team at Neal’s Design • Remodel are excited about recent changes in our showroom. We have added stunning new kitchen displays and products that will transform your cooking, dining and storage spaces. We would like to invite you to visit our showroom to discover some fresh and fabulous ideas for your own home. Appliances and fixtures. If you look around the display, you’ll notice a 36-inch gas cooktop by Dacor, a stainless steel undermount single bowl farm sink by Karran equipped with a polished nickel finish faucet by Moen, “Weymouth.” Crystal knobs and polished nickel cabinet hardware complete the look. Wall paint. Our designers are often asked about the paint colors they choose. The color selected for this display is Mount Saint Anne by Benjamin Moore. Transitional kitchen display featuring Brookhaven cabinets, Cambria quartz counters, Hamilton Parker flooring and a chandelier from Crystorama. Cabinets. Brookhaven framed construction maple cabinets by Wood-Mode were used for this display. Coronado Recessed inset doors in “Nordic White” and “Slate” finishes create a classic yet modern look. Clear glass inserts and 3/8-inch thick glass shelves were used to display china and glass and also provide accent lighting. Slab drawer fronts were combined with framed drawers on the “Slate” cabinets to add interest and for easy maintenance. Counters. 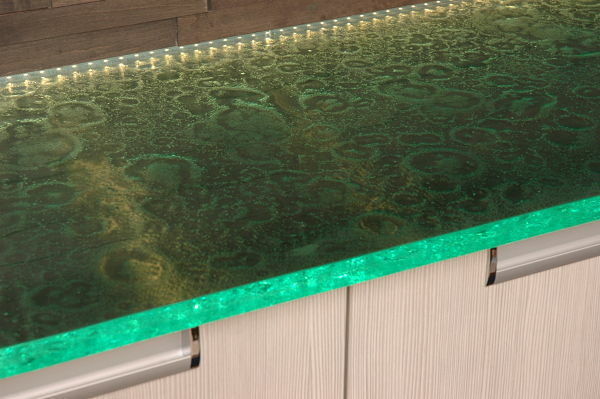 Quartz countertops by Cambria provide the look of marble and granite and unify the contrasting cabinet finishes. 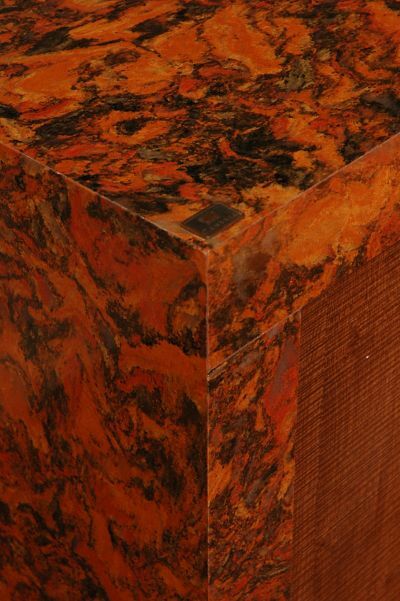 Three-centimeter (3cm) thick slabs of Torquay were used for the perimeter counters and finished with an Ogee edge. Bellingham in a 2cm thickness with a standard eased edge was used to top and repurpose a floor display table that was reinforced with brackets to hold the weight of the stone and painted black. Dark and light cabinet finishes define a kitchen with contrast. Slab front drawers were used with framed doors and drawer fronts to create interest and provide easy care surfaces. Counters and the cabinet style unify the elements. Backsplash. If you’ve visited our showroom in the past, you’ve seen some of the stunning tiles and patterns used in our kitchen and bath displays. 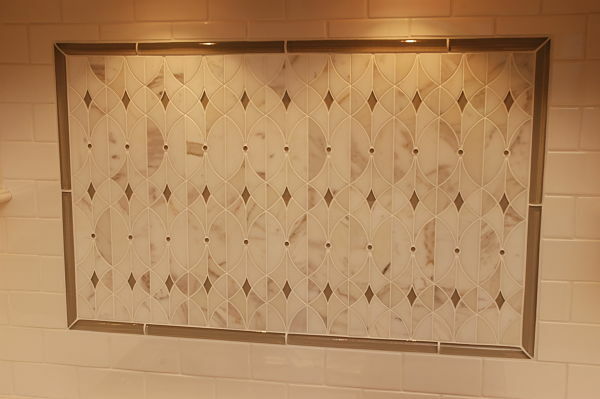 For the Transitional kitchen display our designers selected tile from Kemper Design Center. The field tile is a 3-by-6 inch ceramic wall tile “Star White” set in a “subway” pattern. The linear 1-by-12 inch frame tile is also a ceramic tile made by Artistic Tile, Pavarotti Pearl Gloss “Flute Liner.” The inset tile is an interlocking mosaic sheet of mixed materials also from Artistic Tile, Valencia Lucido large Portico Vetromarmi Collection in Calcutta Gold Polished Marble with Pearl Gloss detail. Close-up of the ceramic and mixed material mosaic backsplash in the transitional kitchen display. Lighting. Our designers found a stunning chandelier for the display from the Cyrstorama Lighting Collection at Ferguson’s. 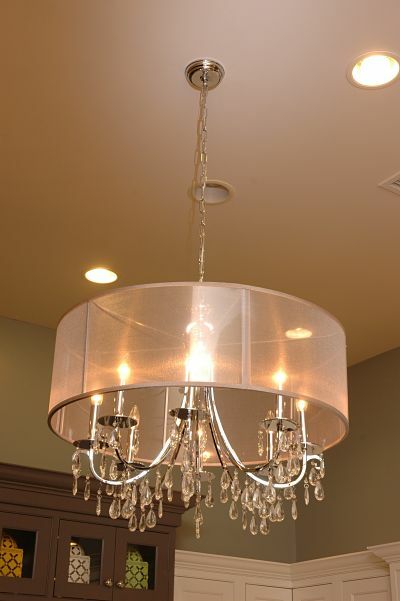 Shaded crystal chandelier by Crystorama is a focal point in the display. Cabinets. The flat fronts and frameless design of contemporary cabinets are rapidly gaining popularity with homeowners who are gravitating toward minimalism and functionality. The cabinets used in this display are Wood-Mode frameless construction, Vanguard Plus in “Rough Sawn Euro Oak Veneer” in matte natural finish with a black glaze. In selecting finishes, it is helpful to talk with a designer who is familiar with product lines and the various effects finishes and glazes create on wood and veneer. Lights. 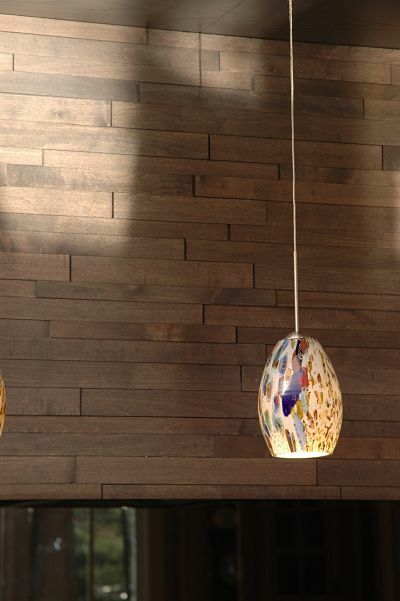 If you love contemporary design, you know that lighting is often a focal point in the room. 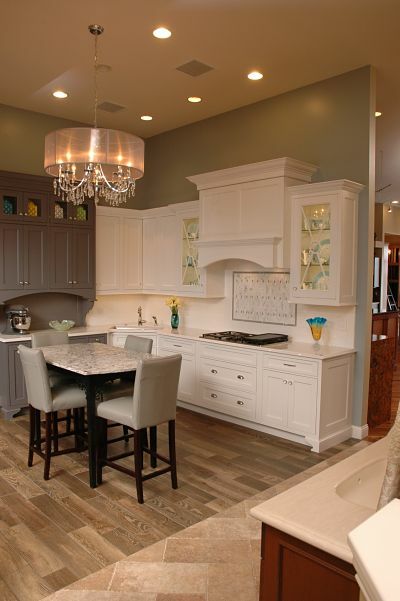 In this display we used pendant lights from Ferguson’s George Kovacs line. Kovacs is known for contemporary light styling. 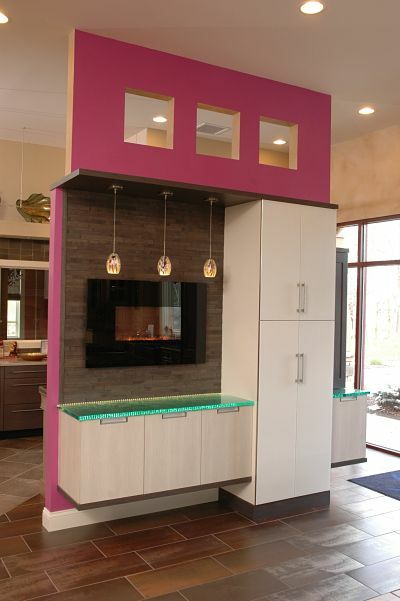 A warm, colorful contemporary cabinet configuration with clean lines, natural wood, pendant lights and quartz counter. Counter. Cambria quartz sheets were used for the wrap-around counter surface. A 4cm thickness was selected in the colorful “Aberdeen” pattern and finished with a Seacliff edge. Close-up of Cambria “Aberdeen” counter surfacing and edging. Hardware. 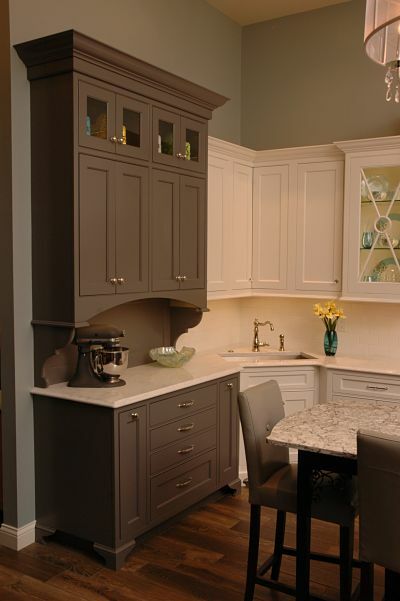 Our designers chose Schaub “Stonehenge” cabinet hardware to accentuate the flat front cabinets with a sculptural form. 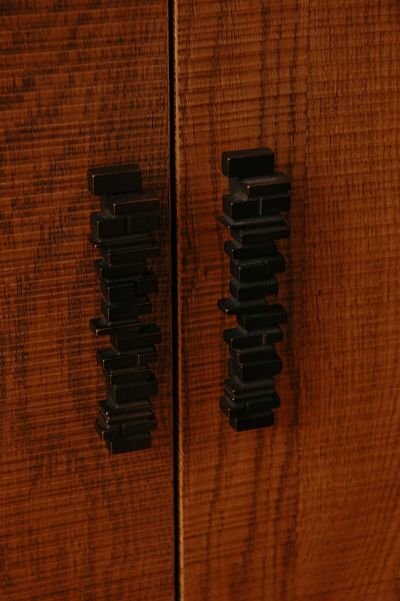 Schaub & Co. “Stonehenge” black metallic cabinet pulls. Often when people plan a kitchen remodeling project, efficient and ample storage is at the top of their list of “must haves.” We are always looking for practical storage ideas that make working in and organizing a kitchen easier. 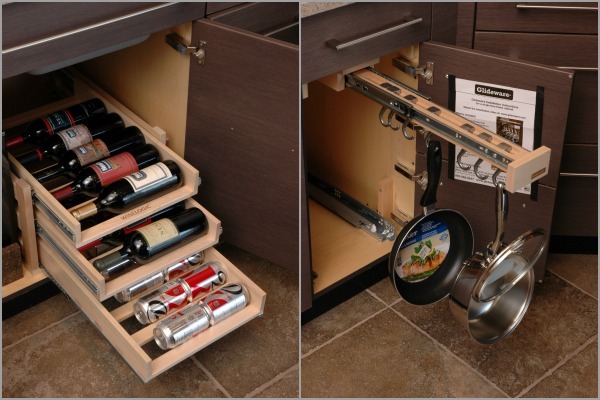 Explore our kitchen displays for pullout storage for wine and pans. Left: Wine storage by Wine Logic. Right: Pan storage by Glideware. Cabinets. 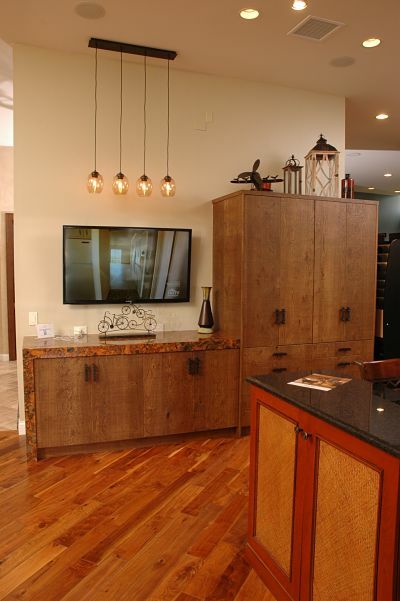 When you walk into our showroom, your eyes will be drawn to the trendy display in the entry. The base cabinets are from Wood-Mode’s Vanguard Plastic Door Collection in #806 Vertical Grain Gulf Shores. This line is textured Italian laminate made for easy care and a structural look. The tall cabinets are Wood-Mode Vanguard frameless construction cabinetry in “White Gloss” finish with “Nordic White” on the side panels. Wall paint. We chose “Radiant Orchid” Pantone’s color of the Year for 2014. Valspar has the rights to produce the paint this year and it can be purchased at Lowe’s. Fireplace. The very “cool” electric fireplace in the display is from Hamilton Parker. The product is Modern Flame's AL40CLX-G, a 40-inch Ambiance CLX electric fireplace with black glass. Counter. The spectacular lit glass counter is from Studio L Glass Works. It is 1-inch thick and regular clear glass in the “Tactile” pattern. The counter is lit with warm LED tape lights. Glass counter with LED lights. Wall treatment. The stone-look wall treatment in the display is Friendly Wall’s “Davis” pattern. Lights. Pendant lights are LBL Mini Monty. Close-up of contemporary pendant light and wall treatment. We hope you’ll visit us soon and talk to our designers about other details in the showroom displays. Remember if it’s NEW, and trending NOW, you’ll find it at NEAL’S!